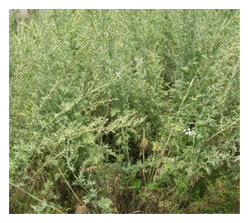 You are at:Home»Herbs»Artemisia absinthium Linn. Latin name : Artemisia absinthium Linn. Description : The whole plant has alterative, analgesic, anthelmintic, antibacterial, antifungal, antidepressant (mild), antiinflammatory, antiparasitic, antirheumatic, antiseptic, antispasmodic, appetiser, aromatic, astringent, bitter, carminative, cholagogue, deobstruent, diaphoretic, digestive, disinfectant, diuretic, emmenagogue, febrifuge, slightly narcotic, nervine, purgative, stimulant, stomachic, tonic and vermifuge properties. It warms the body, arrests bleeding and clears toxins. It increases appetite and promotes digestion. It is valued especially for its tonic effect on the liver, gallbladder and digestive system. It increases stomach acid and bile production, improving digestion and absorption of nutrients. It also eases wind and bloating and is also useful in dyspepsia, heartburn, hysteria, spasmodic affections as epilepsy, in nervous irritability, nervous depression, mental exhaustion and in intermittent fevers. Also useful in obstructions of the liver and spleen. The common name, Wormwood, describes its ability to act as a “wormer” to expel worm infestations in children, especially roundworm and pinworm. Clinical studies have demonstrated a 100% cure rate in 485 cases of tertian malaria and 92.7% rate in 105 cases of subtertian cerebral malaria. For these reasons the U.S. Army is presently investigating it as a treatment for drug-resistant malaria. It is further endorsed as a natural substitute for chloroquine. Recommended Dosage : 4 to 9 g powder of dried stem. Contraindication : This herb is a uterine stimulant and should not be used during pregnancy, as it can cause spontaneous abortion. Nursing mothers should not use this herb. Do not overuse; it may be habit forming with long-term use, and prolonged use may cause nausea, vertigo and insomnia and may affect the nervous system. Those allergic to pollen should not use wormwood. Also contraindicated in gastric and duodenal ulcers. Do not exceed recommended dosage. It should never be given to children below the age of 12. Do not use if you are taking Phenobarbital.